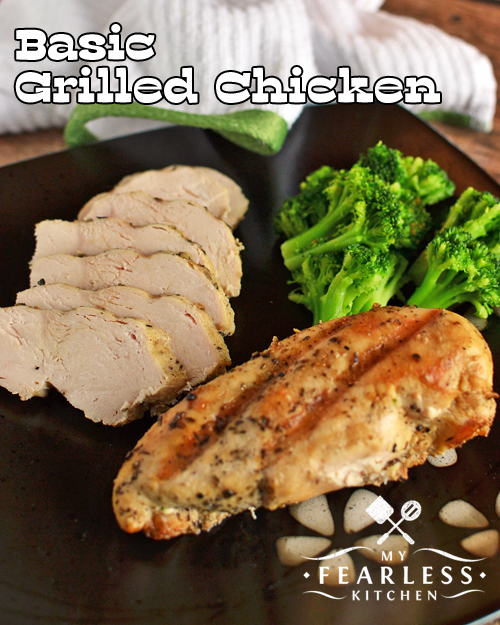 This Basic Grilled Chicken can be used as a base for a fast weeknight meal! Grill up a big batch, eat some tonight, and freeze some for later. There are momma cows to watch over as they have their calves. There is fence to fix. There is a weedy garden plot to get ready. There is hay equipment to service. And this year John and his dad are replacing the floor on the big trailer we use to haul hay. And of course, there are tractors to (pretend to) ride on. 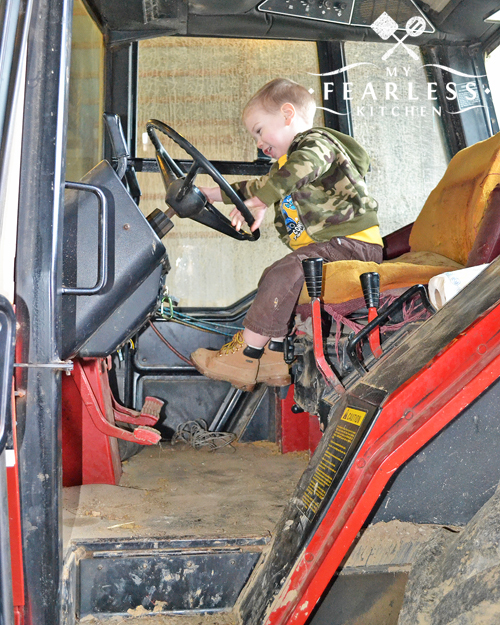 This farm kid just loves his tractors! This spring and summer are going to be pretty fun. Little Doc is two and a half, and he loves being outside. He is also just about old enough to “help” – in terms of “please bring me that screwdriver” and “don’t run away!” Hopefully John and I will both be able to get some more work done outside this summer! While we may not be out in the field planting corn and soybeans like many of our neighbors, we definitely have a busy spring while the hay fields are growing. This busy season makes me get planning ahead for dinners! With John either at work or working in the barn until it gets dark, we don’t have a lot of time for meals. My slow cooker comes in really handy this time of year! And I also love to grill. Even better? The basics for a meal that I can grill ahead, freeze in smaller portions, and get out when we’re ready for it. This Basic Grilled Chicken is just that! 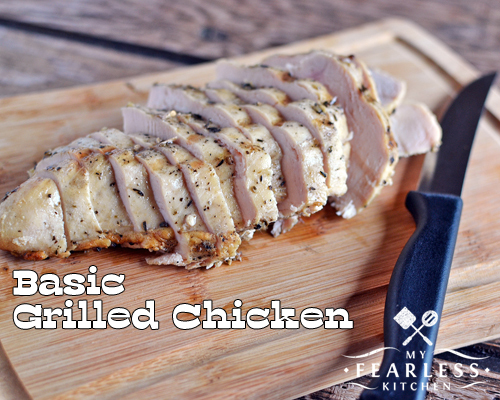 The prep for this Basic Grilled Chicken recipe is super simple. Mix three ingredients (vinegar, oil, and a seasoning) to make a marinade. Put the chicken in a Ziploc bag, pour the marinade over the chicken. Pop that whole thing in the refrigerator for a couple of hours (or even overnight). Then toss the chicken on the grill! Grilling the chicken is pretty quick – about 20 minutes. The trick is to start it on high and then lower the heat to medium. Get your grill preheated on high. Grill the chicken for 2-3 minutes on each side to get the outside of the chicken quickly seared. If the chicken sticks to the grill when you try to turn it over, it isn’t quite ready to flip yet. After the chicken is seared, lower the grill’s heat to medium. Leave the chicken on for another 10-15 minutes, turning it over once or twice to get it evenly cooked. A meat thermometer is your best friend when you’re grilling chicken. It is impossible to tell if chicken is fully cooked without using a thermometer. You want the internal temperature of the chicken to be 165 degrees F to know that it’s done. I love probe thermometers like these. But I don’t use them with my grill (anymore). I thought I was being pretty smart one time, and used a probe thermometer on the grill. I closed the grill lid on the cord and came back a few minutes later to find that the heat of the grill lid had melted through the cord. Whoops. Oven doors = insulated. Grill lids = not insulated. So now I only use digital thermometers like this when I’m grilling. Between the marinade and the sear, this chicken stays tender and juicy after cooking. Serve it as is with some vegetables and Roasted Garlic Mashed Potatoes. Slice it up and put it on top of a salad or this Garlic-Parmesan Mac & Cheese. Grill up a family pack of skinless, boneless chicken breasts, slice them, and freeze for a quick weeknight meal when everyone is too busy to cook. Do you want to see more recipes for your grill? Leave me a comment and tell me what you’re looking for! 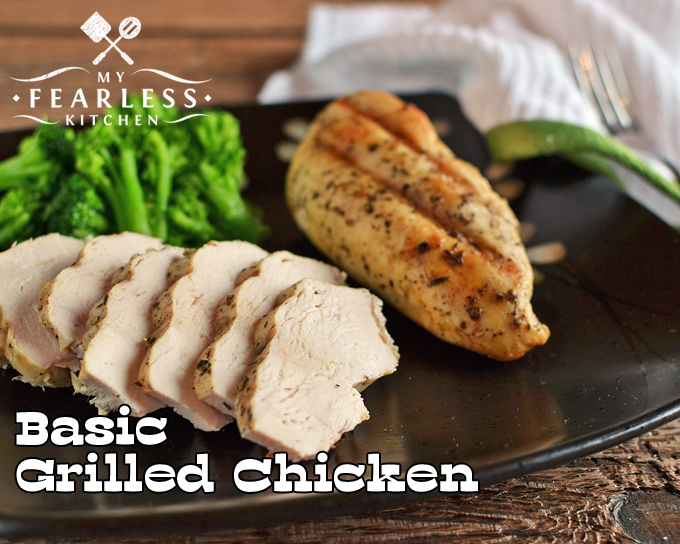 This Basic Grilled Chicken can be used as the base for any meal. Grill a bunch, freeze them, and you've got dinner ready in an instant! Pour vinegar, oil, and Italian herb seasoning in a bowl. Whisk to combine the marinade. Put chicken in a Ziploc bag. Pour marinade over chicken. Refrigerate chicken for 4 hours, or overnight. Heat grill to high. Grill chicken 2-3 minutes on each side to sear it. Reduce grill heat to medium. Grill chicken 10-15 minutes more, turning once or twice, until cooked. When fully cooked, a meat thermometer will read 165 degrees F at the center of the chicken.